Pensacola Lighthouse stands guard over Pensacola Pass, that place where the Pensacola Bay meets the Gulf of Mexico. 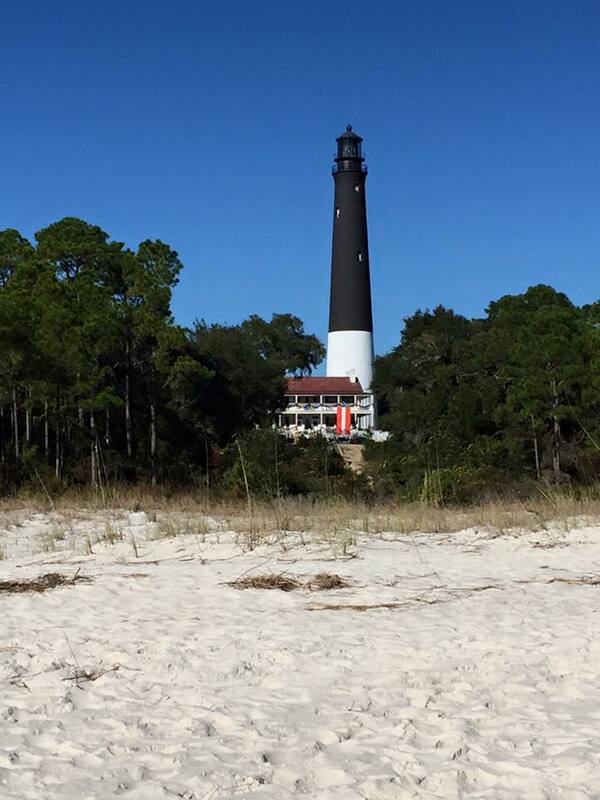 It is a beautifully maintained tower and keepers quarters located on board NAS Pensacola. When we arrived at the lighthouse we entered through the old carriage house which has been restored and serves as a Welcome Center and Museum store that is operated by the Pensacola Lighthouse Association. We were greeted by a very friendly and knowledgeable member who explained that part of the old Keepers quarters has been restored to it's mid 1880's condition and contained many artifacts of the lighthouse as well as exhibits about local Civil War history and the history of the Naval Air Station. She encouraged us to explore the grounds visit the museum and climb the tower. We discovered a lovely board walk through the scrub and over the dunes to a quiet beach that would be perfect for a picnic. It gave us a chance to see the lighthouse tower as you would view it from the water, a black and white sentinel above the trees with a flashing white light every 20 seconds. Pensacola lighthouse as seen from the beach. The winding 177 step staircase is open metal work and the climb is worth the breathtaking view. A warning for those with a fear of heights. I also suffer this phobia and that open staircase was a challenge. From the open catwalk below the lantern room you can look across the pass to Santa Rosa Island and Fort Pickens. You can also see the Navy yard, Perdido Key with the old site of Fort McKree to the West and the Pensacola Skyline. Looking down at the Base you will spot the hangers and support buildings for the Blue Angels, the National Naval Aviation Museum and Fort Barrancas. There is a Docent stationed on the catwalk to answer questions and indicate points of interest. He told us that if you happen to visit when the Blue Angels are flying you can see them at eye level as they take off from their nearby runway. The Light at Pensacola has served since 1824, with a 1 year break in service during the Civil War. The original tower was replaced with the current 150 foot structure and a brighter lens in 1859. It's daymark is white at the bottom and black on top. The first order Fresnel lens was automated in 1965 and remains an active aid to navigation. View of Santa Rosa Island from the Lighthouse Catwalk. The Pensacola lighthouse has stood through many disasters both natural and man made. It has suffered 2 lightening strikes with damage to electical components due to a faulty lightening rod. It also survived an earthquake in 1886 and has withstood the fierce winds of numerous Hurricanes. During the Civil War the lighthouse was abandoned by Union forces in January of 1861 when they moved across Pensacola Bay into Fort Pickens. The Confederate Army took control of Fort Barrancas and the Lighthouse tower. They removed and hid the lens leaving the Pensacola Pass dark until December of 1862 when the Union Army regained control after the Battle of Pensacola. The tower had been struck by a half dozen cannon rounds but none penetrated the outer wall of the lighthouse. Does the history of the Pensacola lighthouse live on? psychics, clairvoyants and Sci-Fi's Ghost Hunters think so. It is called one of the most haunted lighthouses in America. The Pensacola Lighthouse Association even offers a ghost hunt tour complete with EMF monitors for those interested in a Paranormal experience. We passed on that option. If you have an opportunity to visit NAS Pensacola and the lighthouse you might want to stop at Fort Barrancas, administered by the National Park Service as part of the Gulf Islands National Seashore and the National Naval Aviation Museum. Those that do not have military ID's can still visit by making a reservation at the Lighthouse or Museum and showing a picture ID at the bases security gate. Pensacola loves it's Pelican statues, this one can be found behind the carriage house.